African American now runs Confederate president's historic site in rural Western Ky. Between Elkton and Hopkinsville in southwestern Kentucky, along US 68-KY 80, stands a tall concrete obelisk, much like the Washington Monument but somewhat smaller. Like it, this one recognizes the father of a country, but one that didn't last long: Confederate President Jefferson Davis, who was born in the little burg of Fairview in 1809, a few months after Abraham Lincoln, about 125 miles northeast. It's a state historic site, and it's now run by an African American, Ron Sydnor, above, whose ancestors Davis and his allies fought a war to keep enslaved. "Sydnor said he believes that his ethnicity too will be a plus in his capacity as park manager," Tonya Grace writes for the Todd County Standard. "He said it will give him a chance to dispel some of the myths surrounding the history of the Civil War era, and he noted that black history is intertwined with that history." Sydnor told Grace, “I see myself as a bit of a historian, and this is history.” He has a bachelor’s degree in history with an emphasis on the colonial era through the Civil War. He is a 20-year Marine veteran who was born in Russellville and grew up and now lives in Pembroke, both nearby. He started working in the state parks system five years ago. Sydnor "observed that African Americans tend to stay away from things that have an association with the Confederate States of America, but he said he hopes to utilize the park as an educational tool “because they need to know” the history," Grace writes. The U.S. Department of Agriculture created the Summer Food Service Program to feed 31 million students who are eligible for free and reduced price lunches during the school year but who may not have sufficient food during the summer. The program may not be reaching eligible rural students. "For families living in rural America, rates of poverty and food insecurity are among the highest in the country, yet of all the SFSP sites, less than one-third are located in rural communities," The Carsey Institute at the University of New Hampshire reports in a new study. Carsey found lack of transportation and long distances to SFSP sites are the largest barrier to rural program implementation and participation. "Sponsors prefer operating programs as 'open sites,' which are locations like parks or schools where any child can go to obtain a free meal," Carsey reports. "However, to run an open site more than one-half of the children in the local school’s attendance area must be eligible for free or reduced price meals during the school year." Since rural students aren't often geographically concentrated many rural school districts struggle to meet the 50 percent requirement for an open site. Open sites make up 83 percent of SFSP's program, because they do not require enrollment in a formal program. Finding sponsors for open or enrolled programs in rural areas can be difficult due to the challenges and costs inherent with transporting food and/or children, Carsey writes. 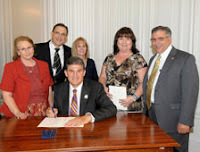 The American Recovery and Reinvestment Act of 2009, better known as the ecponomic stimulus bill, provided funding to enhance state and local law enforcement. An audit found that the Department of Justice's Office of Community Oriented Policing Services (COPS) distributed most of the $1 billion without incident, but errors in the funding calculation sent money to 45 applicants that didn't deserve it and hurt 40 other applicants: 34 didn't receive a grant award due to the error, and received less money than they should have, Andrew Ramonas of MainJustice reports. Most of those in both categories serve small populations. "COPS intends to remedy these inaccuracies by ensuring those agencies that were negatively affected will be provided funding" from the 2010 hiring program, the agency said in its report. The program required all states or territories that applied to receive at least 0.5 percent of the total. Five jurisdictions -- Hawaii, Wyoming, South Dakota, Maine and the Northern Mariana Islands -- received awards they otherwise wouldn't have. Six states -- Tennessee, California, North Carolina, Massachusetts, Florida and New Jersey -- were awarded less money than they would have received without the minimum requirement. Avista Corp.’s Kettle Falls, Wash., wood-burning generating station produces enough energy to power 40,000 homes. Instead of being a shining example of the application of biomass energy it has become a key example of the problems with the fuel. "Located in the timber belt of the Selkirk Mountains, the plant has trouble getting wood fiber at prices that produce affordable electricity," Becky Kramer of The Spokesman-Review in Spokane reports. When the cost climbs too high, the plant shuts down and can be idled for weeks at a time. "The Western U.S. is biomass rich … but it’s still about fuel. Can you get it in reasonable quantities and affordable costs? That hasn’t been solved yet," David Naccarato of McKinstry Co., a Seattle-based firm that works on biomass projects, told Kramer. Wood-burning power plants offer the attraction of being considered a "carbon-neutral" energy source, because as trees grow they absorb the carbon dioxide released into the atmosphere by burning them. We've closely followed the complaints of rural school advocates who say that the federal formula for distributing Title I funding discriminates against rural schools, most recently here. Now those advocates have gained a powerful ally. The American Farm Bureau Federation has signed on as a co-sponsor of the Formula Fairness Campaign, which aims to end discrimination against rural schools in "formula for distributing federal funds for the education of disadvantaged children," Marty Strange reports on the campaign's website. Tuesday's primary elections for Congress confirmed once again that rural and urban voters often choose different candidates. Rural voters were anything but predictable, Bill Bishop reports in the Daily Yonder. In Kentucky's Republican primary for the Senate, tea party advocate Rand Paul defeated Secretary of State Trey Grayson, who had claimed an endorsement from Republican Sen. Mitch McConnell in the race for Sen. Jim Bunning's seat. "The Tea Party, conventional wisdom says, is strong in largely white, rural areas," Bishop writes. "Yet Rand Paul gathered his lowest vote totals in rural Kentucky where the turnout was highest." Paul won 63 percent of the vote in cities compared to 54 percent in rural counties, which boasted the state's highest turnout rates. He took 66 percent of the vote in exurban counties. The Democratic primary between Lt. Gov. Daniel Mongiardo of Hazard and Attorney General Jack Conway of Louisville was cast as rural-vs.-urban, and voting reflected that divide. Conway, who won the nomination, took 54 percent of the vote in cities but just 36 percent in rural counties. Meanwhile, "The Pennsylvania contest to fill the seat in Congress held by Democrat John Murtha was held in the 99th most rural district" out of 435 in the House, Bishop writes. "It was a traditionally Democratic district, but Republicans thought they could pick it up, largely because 37 percent of the voters lived in rural areas." Instead, Democrat Mark Critz, who is pro-life, pro-gun and anti-Obama health bill, beat Republican Tim Burns, who became involved in politics through the tea party. The Democratic Senate primary in Pennsylvania saw U.S. Rep. Joe Sestak defeat incumbent Sen. Arlen Specter, who had defected to the Democratic Party. Sestak, the more liberal candidate, won his highest percentage of votes in rural counties, Bishop reports. He took 59 percent of the vote in rural Pennsylvania compared to 53 percent in urban areas. Alltech, an animal-food-supplements company, has announced plans to build the nation's second largest algae factory in Kentucky to make biofuel and do research on new approaches for mitigating climate change. Alltech President Pearse Lyons made the announcement at the firm's 26th annual International Animal Health and Nutrition Symposium in its headquarters town of Lexington, Ky.
A Department of Justice investigation has uncovered a "a nationwide conspiracy in which financial advisers to municipalities colluded with big banks to rig bids on bond issues for states and local governments, including one of the most rural states, West Virginia. Martin Z. Braun and William Selway of Bloomberg report that a list filed in U.S. District Court in Manhattan on March 24 says the conspirators "rigged bids on auctions for so-called guaranteed investment contracts," which hold tens of billions of taxpayer money. The alleged conspirators include "Bank of America Corp., Citigroup Inc., JPMorgan Chase & Co., Lehman Brothers Holdings Inc., Wachovia Corp. and 11 other banks," Bloomberg reports. The alleged conspiracy stretched from California to Pennsylvania and included more than 200 deals involving about 160 state agencies, local governments and nonprofits. "The whole investment process was rigged across the board," said Charlie Anderson, who retired in 2007 as head of field operations for the Internal Revenue Service’s tax-exempt bond division. "It was so commonplace that people talked about it on the phones of their employers and ignored the fact that they were being recorded." Anderson estimates that bid-rigging cost taxpayers billions of dollars and said prosecutors are lining up conspirators to plead guilty and name names. Chicago chef Rick Bayless, winner of the America's Top Chef award, prepared the meal for the dinner, the second full state dinner held by President Obama and First Lady Michelle Obama. Bayless told National Public Radio that he uses only locally grown produce and had to recreate his menu in Washington without the benefit of his usual supply. (Read more) The American Wagyu Association will be holding its 2010 national sale in Lexington, Ky., in October 2010. Two entrepreneurs in rural Washington County, Kentucky, are hoping to promote and expand the county's sustainable fiber industry by creating products from alpaca and sheep. Shawn Malloy of Sunshine Alpacas of Kentucky and Norma Jean Campbell of the Campbell Farm Wool Art Center also hope to "educate others about the crafts and their potential economic benefits," reports Katie Pratt of the University of Kentucky College of Agriculture. "There's a synergy of working together with the whole set of fiber people in the state," said Rick Greenwell, the county extension agent for agricultural and natural resources. "When you've got more products to sell, you're going to attract more people to the area." Malloy, right, and his wife moved to Kentucky from Maine two years ago, and the couple processes "fiber for farmers across the nation in their fiber mill, and they are developing extensive product lines from their own Suri and Huacaya alpacas," Pratt writes. 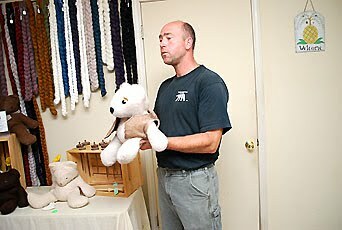 Their products include yarn, woven fabrics and a teddy bear, right, named the Tucky Bear. As evidence of the growth of Kentucky's fiber industry, the first Kentucky Sheep and Fiber Festival was held on a beautiful weekend, May 15 and 16, at Masterson Station Park in Lexington, Ky. The heavily attended event provided a place to sell or purchase hand-dyed yarn, roving, weaving and knitting supplies, as well as live animals. Alpacas, llamas, and sheep were available to feed, pet, shear or buy. 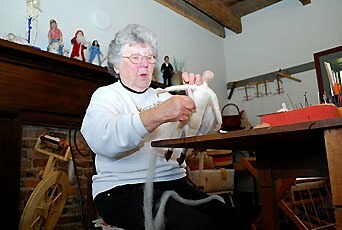 The festival also included classes for working with fiber, demonstrations of sheep shearing and competitions for the highest quality fleece and yarn. The weavers, vendors and animal owners were generous and knowledgeable about their wares. Unique hand-dyed yarn, as well as locally-produced roving, were abundant. Chefs from Sullivan College cooked competitively which made the festival smell like a restaurant rather than a stockyard. The festival was held the same weekend as the Bluegrass Classic Stockdog Trials. Both dog-lovers and fiber-lovers found a place this weekend at Masterson Station Park. Farmers may be returning to the time when they used every part of a corn plant in some facet of the farm's operation. "Ethanol producers are increasingly using corn stover to power their plants, and they're working on using the stover itself to make the fuel," Philip Brasher of the Des Moines Register reports. Stover, the parts of the maize plant not harvested including the stalk and leaves, is generally left behind in fields to add organic matter to the soil. "Now, agribusiness companies Monsanto Co., Archer Daniels Midland Co. and Deere and Co. see profits in stover and are collaborating on research into economical ways of harvesting, processing and using the stuff, including as substitutes for petro-chemicals," Brasher writes. As corn yields increase with ethanol production, the amount of stover left in the field has also been rising, leading farmers to look for ways to profit from the surplus. "A 200-bushel-per-acre corn crop, which is common today, produces 3.8 dry tons of stover an acre," Brasher writes, and seed giant Monsanto reports a 300-bushel crop of the future will produce 4.7 dry tons of stover. The National Rural Assembly will host a webinar Monday, examining the implications for rural America of how the Federal Communications Commission will regulate broadband. The event will be a "conversation with policy experts, broadband advocates, and rural Internet service providers discussing what Title II reclassification means for rural consumers and the future of rural broadband," says a news release. Cattle for computers: Could server farms be powered by waste from dairy farms? Cattle have been put to a variety of uses, but a new research paper suggest they could be the key to powering the next wave of computer innovation. 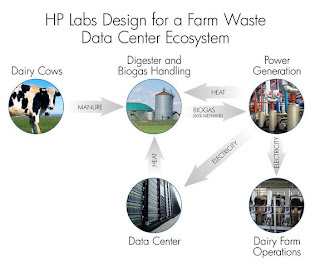 "While not immediately intuitive, the idea plays on two trends: the building of computing centers in more rural locales, and dairy farmers’ efforts to deal with cattle waste by turning it into fuel," Ashlee Vance of The New York Times reports. The paper, written by Hewlett-Packard engineers, says "a dairy farmer could rent out land and power to technology companies and recoup an investment in the waste-to-fuel systems within two years," Vance writes. As more Americans quit smoking, tobacco farmers are again feeling the effect of decreased demand for their crop. The brunt is being borne by Kentucky, which long had more tobacco farmers than any other state and is the nation's largest producer of burley tobacco, a major ingredient in cigarettes. Will Snell, a University of Kentucky agricultural economist specializing in tobacco, tells Bruce Schreiner of The Associated Press that the state could lose a fourth of its tobacco contracts this year. "Many contracts also have been lost in North Carolina, South Carolina, Tennessee and Virginia as smoking continues to decline in the U.S.," Schreiner writes. "The cutbacks mean farmers who've lost contracts might not be able to pay mortgages and rural communities could lose jobs and income as farmers have less money to spend." Jess Burrier, a Cynthiana, Ky., tobacco farmer, recently received a postcard from Philip Morris International, which he had sold tobacco to for several years, thanking him for his contributions and telling him his service wasn't needed this year. Burrier told Schreiner the amount of tobacco he grows under contract shriveled from about 600,000 pounds two years ago to 20,000 pounds this year with another leaf buyer. Does a West Virginia newspaper's editorial policy cause it to violate journalistic ethics? 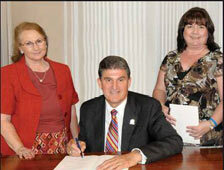 Last week The Dominion Post in Morgantown ran a story about Gov. Joe Manchin signing a law toughening penalties for deadly hit-and-run accidents, but altered the photo of the signing ceremony to omit three House delegates who sponsored the law, Ben Adducchio and Emily Corio of West Virginia Public Broadcasting report. Post editor Geri Ferrara declined a recorded interview but told WVPB the paper has a policy against publishing publish pictures of candidates running for re-election during the political season. The three delegates are all up for re-election. The Society of Professional Journalists code of ethics says to "never distort the content of news photos or video. Image enhancement for technical clarity is always permissible. Label montages and photo illustrations." SPJ President Kevin Smith, a former Dominion Post employee, says in a comment on this item that the paper "is lying to the readers." Original photo on the left, Post photo illustration on the right. The Bristol Herald Courier in Southwest Virginia garnered national attention last month when it was awarded the most prestigious Pulitzer Prize for its reporting on a natural-gas royalties mess, but the newspaper has recently stirred up more local attention, and controversy, by naming a juvenile athlete who urinated on the field while "The Star-Spangled Banner" was playing before a baseball game. "It’s one of the ironies of journalism: We can spend 13 months on a controversial series that eventually wins the Pulitzer Prize for Public Service and not receive a single criticism from readers," Herald Courier editor J. Todd Foster writes in an editorial explaining the decision. "And then we run a daily story on a high school athlete urinating on a baseball field during the National Anthem and the floodgates open." The controversy arose after a May 13 story by Claire Galofaro reported reaction to the incident where the student, described as a football star and "all-around good kid from a good family," responded to a dare by lining up with his fellow Vikings for the National Anthem, unzipping his pants and urinating on the field. The story is headlined "Dare leads to ‘stupid mistake’ by Powell Valley student." Wise County Schools Superintendent Jeff Perry declined to name the student, who he said was being punished, but the Herald Courier did, citing six sources who asked to remain nameless. We couldn't find any coverage of the episode on Coalfield.com, the website of The Post in Big Stone Gap and its parent weekly, The Coalfield Progress in Norton. Publisher Jenay Tate told us in an e-mail, "All newspapers make their own choices and live with the consequences of their actions." After manufacturers rejected voluntary limits on pesticide spraying near streams where salmon are found, the Environmental Protection Agency has announced it will enforce new restrictions. EPA spokesman Dale Kemery said in an e-mail, "EPA will develop new rules for applying the chemicals diazinon, malathion and chlorpyrifos that will include no-spray zones along streams and restrictions on spraying depending on weather conditions," Jeff Barnard of The Associated Press reports. EPA will also require reporting of dead fish. "Even at very low levels, the chemicals have been found by federal biologists to interfere with salmon's sense of smell, making it harder for them to find food, avoid predators and return to native waters to spawn," Barnard writes. Manufacturers Dow AgroSciences, Makhteshim Agan of North America, Cheminova and Gharda Chemicals Ltd. notified EPA on Friday that they would not voluntarily adopt the restrictions. The decision comes a year and a half after the NOAA Fisheries Service found pesticides were threatening 27 species of salmon and steelhead, protected by the Endangered Species Act. We've been following the ongoing investigations by the U.S. Department of Justice and Department of Agriculture into antitrust allegations in agribusiness, and now those complaints have brought investigators to the Southeast to examine allegations of anti-competitive practices in the poultry industry. "The two agencies are about to hold a field hearing in the first step to try to discover if big chicken companies such as Perdue or Tyson Foods are hurting small farmers by imposing arduous contracts and tough price constraints," Bob Keefe of the Atlanta Journal-Constitution reports. The first hearing is scheduled for May 21 in Normal, Ala.
Georgia is the nation's biggest poultry producer, and the Georgia Poultry Federation reports the industry brings an estimated $18.4 billion to the state's economy and directly and indirectly employs more than 100,000 Georgians, Keefe writes. Federal officials say the hearings are more a fact-finding mission than a full-blown investigation. "The goal is basically to have an open conversation, an open dialogue about the competition issues and regulatory issues and to listen and learn from all the different interested parties," Justice spokeswoman Gina Talamona told Keefe. Investigators are interested in the standard contract system that pays poultry farmers to raise chicks owned by big food companies. While most of Middle Tennessee has worked to recover from the widespread flooding of several weeks ago, some of its neighbors to the east are faced with preventable disasters everyday, writes a prominent country musician. "In north­east Ten­nessee, Ken­tucky and West Vir­ginia, man­made dis­as­ters are hap­pen­ing every­day in the form of moun­tain­top-removal coal min­ing," Grammy Award-winning singer-songwriter Emmylou Harris writes in The Tennessean. "These dis­as­ters are 100 per­cent avoid­able, but unlike Mid­dle Ten­nessee in the wake of the flood dis­as­ter, com­mu­ni­ties can­not recover from moun­tain­top removal." When the Supreme Court ruled in January that corporations had the same free-speech rights in politics as individuals, we said that would increase the responsibility of broadcast stations to reject false, unproven or misleading advertising. The commercial television station in rural Eastern Kentucky pulled such an ad this week, helping prompt news stories about it, but the spot continued to run on cable systems in the county where the race is on tomorrow's primary-election ballot. "WYMT-TV in Hazard pulled the ad because of questions about its accuracy," reported Dori Hjalmarson of the Lexington Herald-Leader. The ad, placed by a group with the nebulous name Citizens for Eastern Kentucky Government, attacks Chris Harris, a member of the Pike County Fiscal Court, the county's governing body. Harris has criticized Utility Management Group, which operates the Mountain Water District, and the Lexington Herald-Leader reported that the "citizens" group has received $15,000 from the company and $2,500 from its lawyer, Hjalmarson found. Hjalmarson was able to get that information because the advertiser filed a report with the Kentucky Registry of Election Finance. The registry's lawyer said the group was the first to register with the agency since the Supreme Court ruling. Laws on such groups differ widely from state to state. This episode shows that not only do broadcasters have the right (and we would argue the responsibility) to pull false, unproven or misleadign ads, news media have a responsibility to report on such advertising. Broadband penetration among Internet users in rural areas has experienced double-digit growth in the past year, driven largely by competition among regional Internet service providers, says a new study. "Although rural markets have witnessed significant increases in broadband penetration during the past few years, these areas still lag behind the penetration rates of metropolitan areas," Brian Jurutka, senior vice president of comScore, a publicly traded company that specializes in measuring digital media and conducted the study, said in a news release. "As the primary drivers of rural broadband growth, regional ISPs have the opportunity to increase their market share by delivering broadband to the millions of households still relying on dial-up services." Rural crisis hotlines created to assist Midwestern farmers deal with the unique emotional problems that can be associated with agriculture and rural life face an uncertain future as they fight to find funding. Congress created the Farm and Ranch Stress Assistance Network in the 2008 Farm Bill but did not fund it, leaving the existing rural hotlines to find their own funding, Lynda Waddington of the Iowa Independent reports. Now hotlines in at least four states, including one in North Dakota that was created in 1969, face uncertain futures. "There are no further funds to continue our operations, and the existence of the helpline is very, very tenuous at this point," Charlie Griffin, project director of the Kansas Rural Family Helpline, told Waddington. "The Kansas program, which is one of seven in the Midwest under the umbrella of Iowa-based AgriWellness, offers a statewide hotline staffed by individuals who have specific experience and/or training to help rural residents and agricultural producers through a wide-array of stressful situations," Waddington writes. "It is important to understand that behavioral health problems for people in agriculture come wrapped up with other life problems," Griffin explained. "Most of the time those are financial programs — not always, but much of the time. In many cases there is an agricultural operation that is struggling, and people trying to figure out how to manage debt loads, loan payments or medical expenses. That is a very typical call for us." In March we reported the Missouri bill that would re-establish horse slaughtering was gaining steam, but its momentum appears gone. Last week a conference committee of House and Senate members removed Republican Rep. Jim Viebrock's provisions to allow horse slaughtering for human consumption from an agriculture bill, Chad Livengood of the Springfield News-Leader reports. The first field test of genetically modified forest trees has been approved by the U.S. Department of Agriculture. "Nearly 260,000 eucalyptus trees, engineered to be cold-tolerant, will be planted and allowed to flower in field trials by a South Carolina-based company, ArborGen," Gayathri Vaidyanathan of Environment & Energy Daily reports. "The plantings will occupy more than 300 acres in seven states. Earlier trials had allowed planting of the trees without flowering." ArborGen says "Future genetic modifications, including reduction of a tree-bark compound called lignin, should make the trees a good feedstock option for second-generation cellulosic ethanol production," Vaidyanathan writes. Eucalyptus can be used for both pulp and production of cellulosic ethanol if the technology improves, so some view the tree as the key to revitalizing the Southern timber industry. "This is about opportunities to produce a biomass crop that can revitalize rural communities in the southeastern U.S.," Barbara Wells, CEO of ArborGen, told E&E. USDA says the trees will have minimal environmental impact if released in a controlled and regulated manner, but several environmental groups have still objected to the plan. The coal-fired power plant the East Kentucky Power Cooperative wants to build on the Kentucky River in Clark County, Ky., would further damage an already polluted river by dumping coal ash in the river's floodplain, writes internationally known Kentucky author and farmer Wendell Berry, left, who lives near the river. "As a native and longtime resident of the Kentucky River watershed, as a rural electric cooperative member and rate-payer, and as a conservationist, I am writing to oppose the granting of this permit," Berry writes in The Courier-Journal of Louisville. The plant would have "a working life of only 33 years, whereas the wastes stored on the site will remain toxic and continue to pollute ground water and the river virtually forever," Berry writes. "We are not talking here about organic wastes that would eventually degrade into harmlessness. We are talking about permanent poisons such as lead, mercury, cadmium, zinc, selenium, arsenic, thallium, molybdenum, and boron — neurotoxins and carcinogens." 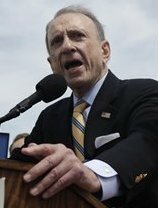 U.S. Sen. Arlen Specter of Pennsylvania, the Republican-turned-Democrat now fighting for his political life in Tuesday's Democratic primary, is targeting rural voters with a pro-gun message in ads on websites of newspapers in the western and central parts of the state, reports Greg Sargent on The Plum Line blog of The Washington Post.